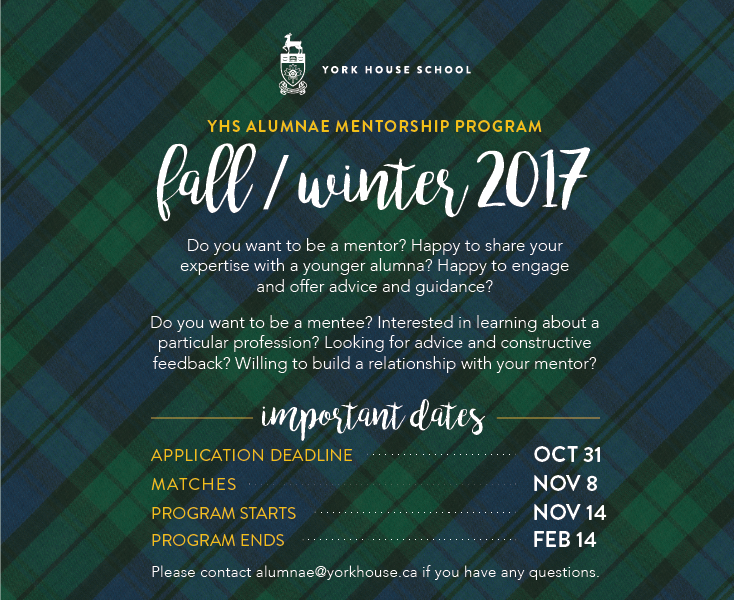 The YHS Alumnae Mentorship Program launched online in November and to date, we have matched 24 alumnae based on career journeys and experience. The focus of the program is to connect our more experienced alumnae professionals with our more recent graduates and we’re very fortunate that our alumnae are so willing to give advice and offer their expertise and time. Our motto of “Not for Ourselves Alone” always shines through with our alumnae and their dedication to helping their fellow Yorkies. Even though we have always provided mentorship opportunities for our grads, this new program ensures that our alumnae are getting matched with follow up and feedback to build the program effectively. Once our mentees are connected with mentors, email communication is initiated and from there, the mentoring process begins. Alumnae in the fields of law, business, accountancy, graphic design, optometry, film, and the cultural sector are taking part in the mentorship process and we look forward to creating strong links between our alumnae as it moves forward. Time differences notwithstanding, (our alumnae are all over the world), we are excited about the project and to actively see it grow. For more information about our mentorship program, contact Ita Kane-Wilson at alumnae@yorkhouse.ca.